Guest house available for festivals, conferences, vacations, and any short term stays: three blocks from historic Magazine St. restaurants and shops; short walking distance to St. Charles the streetcar line; great neighborhood; two blocks from public transportation (bus line); ten minute ride to the zoo, WWII museum, French Quarter, and Dome. We are offering an efficiency apartment in a separate building behind a historic Uptown New Orleans home just blocks from the famous Tipitina's. One sofabed and one futon sleeps up to four; there is an additional charge of $20/night for adult guests if more than two people are staying; this charge does not apply to children under 18. An additional inflatable mattress available upon request for no extra charge. Kitchenette including microwave oven, hot plate, coffee maker/coffee and small fridge. Free fast wifi (U-verse). No pets or smoking inside; smoking outside on the patio is fine. Bathroom with shower. All bedding, towels, soap, hairdryer, iron provided. Pack and Play (foldable crib) and toys for babies/toddlers as well as a stroller provided free of charge. Back garden seating area available for no additional fee. Minimum 2 night stay; longer stays of several weeks and up to a month available at a discounted rate. Mature and respectful guests only. All utilities paid. Gated. This a very safe, cozy and comfortable apartment that will allow you to experience the best of New Orleans! This apartment is self contained and completely separate from our main house. You will be allowed access to the whole thing except for a small storage space to the side which is not pictured. You will also have access to the backyard garden which is very shady and peaceful and has a table and chairs as well as other seating. I am happy to help answer any questions- I do work so I will not usually be available in person but I can respond quickly electronically. We are usually able to check you in in person, but if you arrive late, we suggest a self check in. We are more than happy to make suggestions or to help out with directions. The area in which the guest house is located offers a lot within walking distance, and we are very close to public transportation lines. This is a great place to stay to get to know New Orleans beyond the French Quarter. The French Quarter is beautiful and easily accessible from the guest house (about a 10 minute drive), but there is a lot more to New Orleans. Note that although we have recently upgraded to a very nice, new sofa bed, that is the apartment's primary bed, and if you have more elaborate mattress needs, this apartment is probably not for you. I am an educator the New Orleans area. I am originally from New Orleans and have lived here my whole life. We love this neighborhood and have absolutely enjoyed every minute of it since moving to it in 1999. We love it's great friendly vibe, it's walkability, and the fact that we are never at a loss for something to do. Our guesthouse is very private and cozy, and since it's nestled in our back yard, you can hear the birds chirping in the morning and enjoy the peacefulness of nature, all while being very much in the center of the city. with Netflix, Hulu, Amazon Prime, etc. Quaint home with all the ideal New Orleans appeal without the crowd. This was a pleasant stay and perfect jumping off point for the Garden District area. Just a quick walk to Magazine Street and the river. Check in/out was straightforward. Really enjoyed the fountain garden and flowers. This is an ideal location for a couple or small family. Lovely coach house nestled in a serene garden complete with cats and a burbling fountain. Thoughtful personal-care niceties; shelves filled with interesting books in a snug and stylish setting; quiet street just a few blocks from Magazine. Peaceful, quiet, and cozy. Nice neighborhood with easy parking. Walking distance to Tipitina’s. Sofa bed but we found it very comfortable. Cute kitties outside and maybe a raccoon late one night. Would highly recommend. Cute little place with close streetcar access. Darleen was very available to answer questions. Great stay! 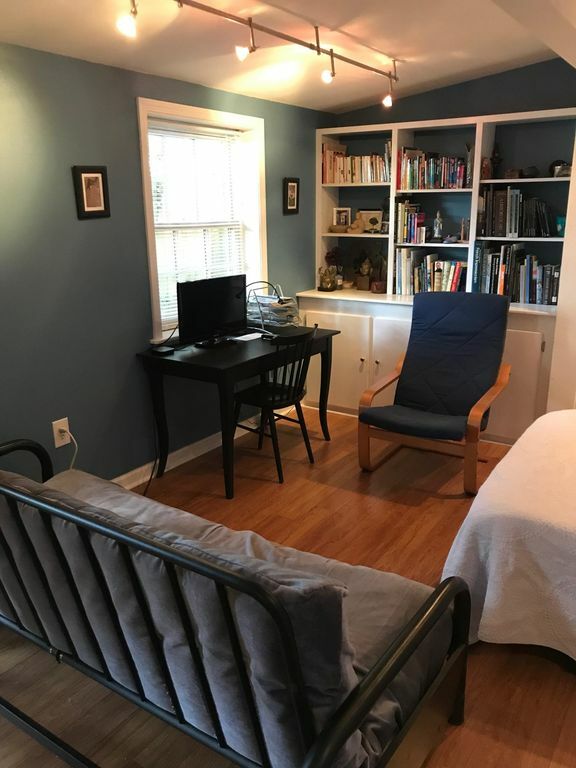 Situated on a very quiet side street within walking distance of many great restaurants and shops, as well as a couple of bus lines and the St. Charles streetcar, this quaint, cozy and clean studio guest house sits overlooking a hidden garden, complete with goldfish pond. Simply furnished, and painted in bright colors, the apartment is a great value for budget conscious travelers. It features a wall of books on a wide ranging array of topics, which means you will likely find something to read no matter what your interest, plus the trove of materials on New Orleans itself. There is a full choice of entertainment available, from Netflix to Hulu to Amazon Prime in case too much Cajun fare has left you unable to move. Darleen made us feel right at home, even leaving us some welcoming chocolate croissants. I would happily stay there again next time I am in the area.